Why do Indians dance all the time? | It's a Miracle! An American coworker once asked me why we Indians break out into song and dance all the time. At that moment I vaguely remember answering that we like to shake a leg instinctively because our streets have a lot of rabid, stray dogs which we want to shoo away when they attempt to bite us. But although asked in jest, the question is worth thinking about in greater detail. And on further reflection, I blame Bhasmasur. “Who is this Bhasmasur?” you ask. You may remember him from your reading of mythology, but his story bears repeating considering the recent fascination with burning whatever our fringe elements don’t like. According to the version I heard from my grandmother (by the light of a hurricane lantern during one of the many monsoon nights we had no electricity) Bhasmasura was an asura or demon who performed continuous penance in a jungle until he grew a really long beard. Pleased with the attentiveness and especially with the termite mound that had formed around him, Shiva came down from Mount Kailash to grant him a boon. This was perfectly natural to me when I was a child and I too wished I could meditate until a termite mound formed around me, at which time I would wish for all the ice cream in the world. But I digress. When granted a wish by Shiva, the asura asked for a boon – the power to burn to ashes anyone whose head he placed his hand on. And what did this ungrateful demon do? Immediately after getting the boon, he showed his true colors by attempting to place his hand on Shiva, his benefactor. The asuras were evil; even as a child, I knew that. Shiva ran as fast as he could. And as Shiva ran to escape from Bhasmasur, he prayed to Krishna – as the gods did from time to time when in deep trouble – to save the day. Faced with a situation rapidly getting out of hand, Krishna could have taken one of many approaches to make Bhasmasur place his hand on his own head and immediately burn himself to ashes. He could have given the demon severe dandruff or insufferable lice. But perhaps, the demons used a kind of hair oil which prevented dandruff or lice. (And this gives me a tangential idea: we should market an anti-dandruff and anti-lice hair oil to the modern consumer as a Bhasmasur Hair Oil). As a playful shape-shifter, Krishna could have also transformed himself into a bird and pooped on the demon’s head. On the other hand, if Bhasmasur wore a crown like every fashionable demon did in the day, it might have impeded the falling bird feces. But Krishna also loved the opportunity to toy with weaknesses in character (and I have to admit that even a sinner like me has enough wits to realize what an amazingly brilliant god Krishna was in this respect). He knew that every Indian – human, god, or demon – loved to dance. So instead of taking any half-hearted attempts at making Bhasmasur destroy himself, he transformed himself to Mohini, a voluptuous temptress, and started dancing to intricate moves. 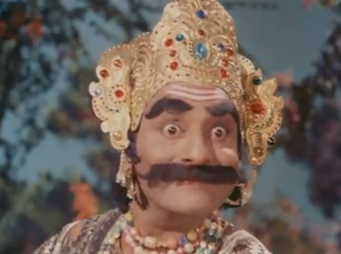 And what did Bhasmasur do when he saw Mohini? In what is likely one of the first reality dance shows on record, Bhasmasur began to emulate Mohini’s intricate dance step for step. As an Indian male, when he saw an attractive female dancing, he did the only thing he could to impress her – he danced. And when Mohini placed a hand on her own head playfully, Bhashmasur imitated the same move. (Yeah… somehow I had figured even as a child that though the asuras were pretty evil, they weren’t particularly bright). Bhasmasur burned to ashes when he placed his hand on his head, but to this day the irresistible urge to dance at every opportunity lies dormant in every Indian. And what of Krishna’s intricate dance as Mohini? It is the inspiration behind the Indian classical dance form Mohiniyattam. So if my American coworker or yours ever asks why Indians love to dance at the slightest provocation, here is a shorter answer: it is because we can’t help it. This entry was posted in because I said so, Indian culture by Anirban. Bookmark the permalink. Hehe… nice post. Thanks for sharing (and for dropping by). Hahahasome! Right from rabid road references to handlebarisms, this tickles all funnybonasurs. Good to see you drop by my lair. Pingback: Global Voices in English » India: Why do Indians dance all the time? Thanks for stopping by and sharing the link. Best wishes! Haha… good to see you back. The line about the dandruff was the spark around which the rest of the blog was built. You are an Indian AND if I’m not mistaken a Sikh. And yet you do not dance? extremely funny :D…I have been questioned the same so many times ..and of course to follow with the same “light bulb changing ” dance move ..erpore keo abar ask korle tomar bloger link ta forward kore debo. A good humored reply. Loved it. True to the tradition you have taken it to the times of past and what they taught us.